The Silver Lining, The Spider Webs! 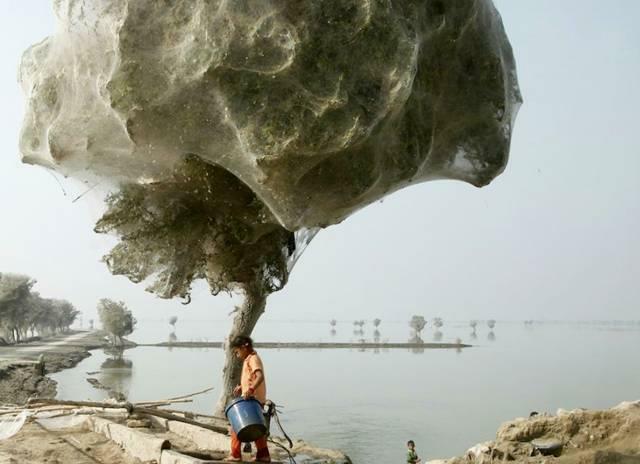 An unexpected side-effect of the flooding in parts of Pakistan has been that millions of spiders climbed up into the trees to escape the rising flood waters. Because of the scale of the flooding and the fact that the water has taken so long to recede, many trees have become cocooned in spiders webs. People in this part of Sindh have never seen this phenome...non before but, they also report that there are now far fewer mosquitoes than they would expect, given the amount of stagnant, standing water that is around. It is thought that the mosquitoes are getting caught in the spiders web, thus, reducing the risk of malaria, which would be one blessing for the people of Sindh, facing so many other hardships after the floods...!!! We require New faces (Males and Females) for our projects of Fashion Modeling ( Ramp and magazine). if You interest , send your details with 2 fresh photos at our official Email ID: fa_agency@yahoo.com.